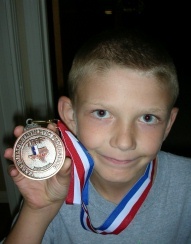 Andrew competed in the regional TAAF track meet Friday evening at the Baylor track in Waco. He didn’t run a very good time, but got 3rd place which qualified him for the state meet in 2 weeks. We will probably go and compete. His best time of the year is 3:06 but he only ran a 3:17 at regionals. First and second place were 3:06 and 3:07, so he really should’ve been in the mix. He just had nothing left at the end of the race. He’s been playing so much baseball (he had baseball camp AND regional baseball playoffs all this past week) that he hasn’t done any track work for probably 3 weeks and I think that has something to do with it. We’ll try to do a little training before the state meet and see what happens. Regardless, I’m VERY proud of him! This entry was posted on Sunday, July 15th, 2007 at 1:54 pm and is filed under Kids/Family. You can follow any responses to this entry through the RSS 2.0 feed. You can leave a response, or trackback from your own site.